The Indianapolis Colts confirmed they were releasing Peyton Manning from their team this morning. During the news conference, both Manning and team owner Jim Irsay appeared to be fighting back tears at times. “This has not been easy for Jim, and this has certainly not been easy for me,” Manning said of the split. Manning, who is 35 years old, signed a $90 million contract extension with Indianapolis early last year. He then missed all of last season after undergoing two surgeries in an attempt to heal an injury to nerves in his neck. Releasing Manning this week allows the team to avoid paying him a $28 million bonus that would be due as a part of this contract. Manning will now be a free agent. He says he will not be retiring, but any teams considering him will undoubtedly question his health before they are willing to sign him. Analysts are saying that Tennessee, Arizona, Miami, New York Jets, and Washington are possible destinations for Manning. As for Manning’s replacement in Indianapolis? 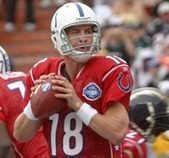 The most often mentioned pick is Stanford’s former quarterback Andrew Luck, which the Colts are expected to take with the first pick in April’s draft.